What causes mucus production to increase? What do different colors of mucus and phlegm mean? When is excessive mucus a problem? How does a neti pot help you get rid of mucus? Which medications treat or get rid of mucus? Mucus is a normal, slippery and stringy fluid substance produced by many lining tissues in the body. It is essential for body function and acts as a protective and moisturizing layer to keep critical organs from drying out. 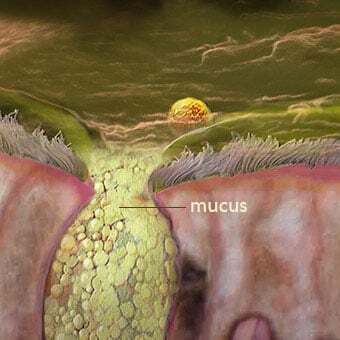 Mucus also acts as a trap for irritants like dust, smoke, or bacteria. It contains antibodies and bacteria-killing enzymes to help fight off infections. The body produces a lot of mucus -- about 1 to 1.5 liters per day. We don't tend to notice mucus at all unless its production is increased or the quality of mucus has changed, as may happen with different illnesses and conditions. Cough is also called tussis. Cough can be categorized as acute (less than three weeks) or chronic (greater than three weeks). Respiratory infections like colds, the flu, and sinusitis are common causes of increased mucus production and coughing up mucus. Allergic reactions are another reason that mucus production can increase. Even consumption of spicy foods can spark excess mucus production in the nasal passages. When you are sick from respiratory infection, you may notice thickened mucus that may appear darker than normal. This thickened mucus is harder to clear than typical mucus. This mucus is associated with many of the characteristic symptoms of a cold or flu. The mucus may also appear yellow-green in color when you are ill.
Phlegm is the term that is used to refer to mucus produced by the respiratory system, particularly when excess mucus is produced and coughed up. 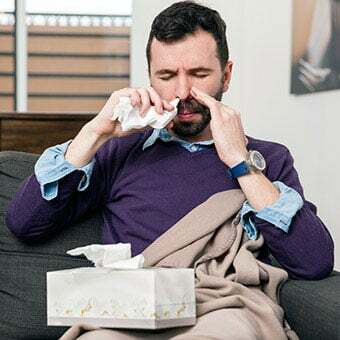 During an infection, the mucus contains the viruses or bacteria responsible for the infection as well as infection-fighting cells of the body's immune system (white blood cells). Phlegm itself is not dangerous, but when present in large amounts, it can clog the airways. Phlegm is usually expelled by coughing, and this is typically accompanied by symptoms like nasal congestion, runny nose, and sore throat. The thickened mucus that accompanies many illnesses is often darker and yellow-colored compared to normal, clear, thin mucus. Greenish mucus means that the mucus contains infection-fighting white blood cells. 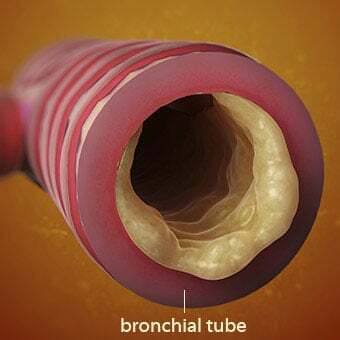 Blood-tinged or brownish mucus is also common with upper respiratory infections, especially if the inside of the nose has become irritated or scratched. While a small amount of blood in mucus is normal, you should see a health-care professional if there is excessive bleeding. 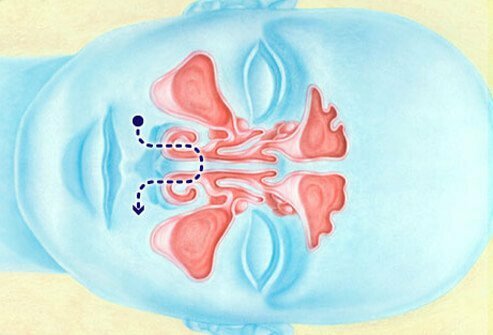 Saline nasal rinses, including neti pots, are an option for those who would like to get rid of excess mucus without taking medications. Bulb syringes and squeeze bottles are other methods to do nasal irrigation. Saline nasal sprays may also be helpful. All these techniques thin out the mucus and help clear the airways and sinuses. Always use sterile saline rinses that can be purchased, or use distilled, previously boiled, or sterile water to make up the solution. Using nonsterile tap water has the small chance of introducing an infection into the airways and sinuses. Certain medications are also able to help thin mucus and enhance the body's ability to remove it. 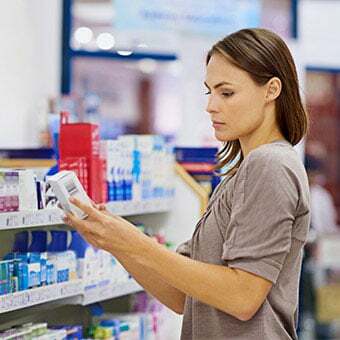 A number of over-the-counter (OTC) medications can help reduce mucus production or help with removal of mucus. Decongestants and antihistamines are two kinds of drugs that may help relieve symptoms of a cold or flu. Decongestants reduce blood flow to the lining tissues of the nose and throat, so your body may produce less mucus. They may help you breathe easier when you have a stuffy nose, but because they are drying, they may have the unintended effect of thickening the mucus that is present. Decongestants should be used only under physician supervision in persons with high blood pressure or heart disease. 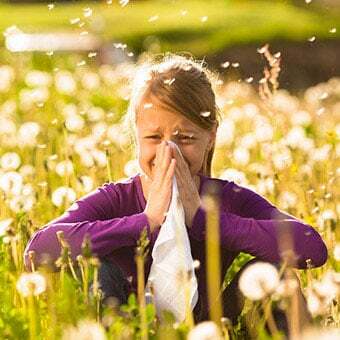 Antihistamines block or limit the action of histamines, substances produced during allergic reactions that cause the lining tissues in the nose to produce more mucus. Older or first-generation antihistamines can be sedating, but newer types of antihistamines can be taken during the day with little sedating effect. An additional kind of medication that can help thin out mucus is guaifenesin. Guaifenesin is a type of drug called an expectorant. Expectorants make the mucus thinner so it is easier to cough up. How did you get rid of excess mucus? Did the color of your mucus indicate a health problem?